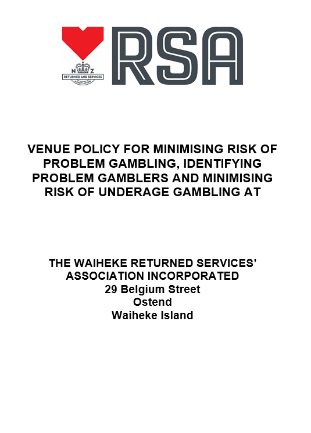 Members of the Royal New Zealand Returned and Services Association can use this website to access gaming machine compliance material. 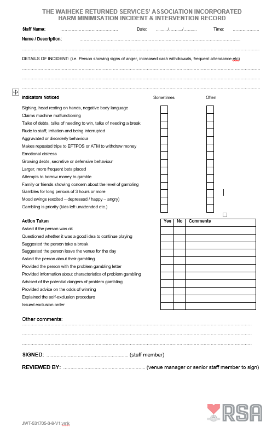 Harm minimisation incident & intervention forms – click here to view sample. Exclusion orders and exclusion order check list – click here to view sample. A summary of the exclusion order legal requirements and recommended best practice – click here to view sample. 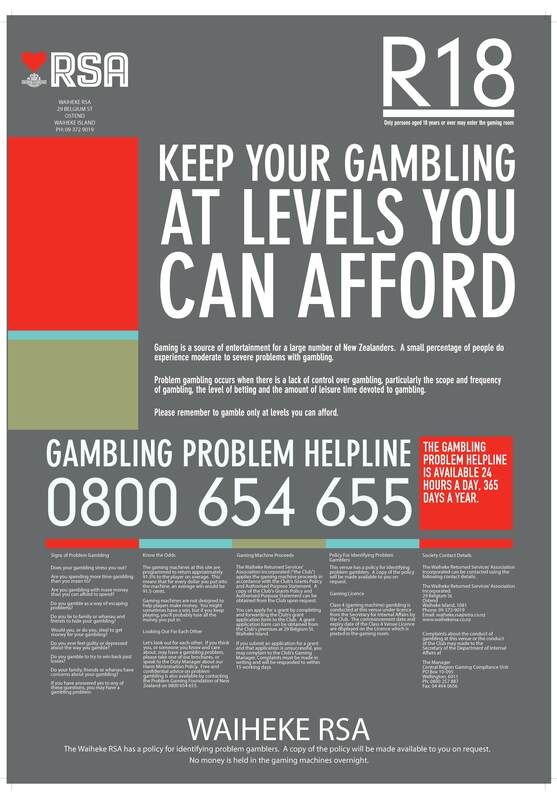 A letter which can be given to potential problem gamblers – click here to view sample. A modern, simple, venue harm minimisation policy – click here to view sample. Details of how to obtain the Jackpot User Manual/Operating Instructions (a requirement of the 2016 Game Rules). A Jackpot system password policy (a requirement of the 2016 Game Rules). A problem gambling training record. 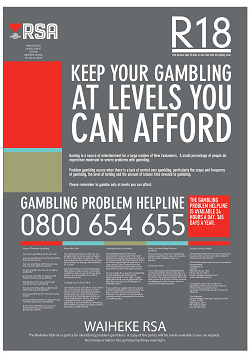 A modern, simple, problem gambling training handout – click here to view sample. Unpaid prize form and unpaid prize check list. Gambling equipment fault form and equipment fault check list. Player dispute form and player dispute checklist. To obtain a venue compliance folder - click here. You can order an A1 compliance sign as per the sample image. 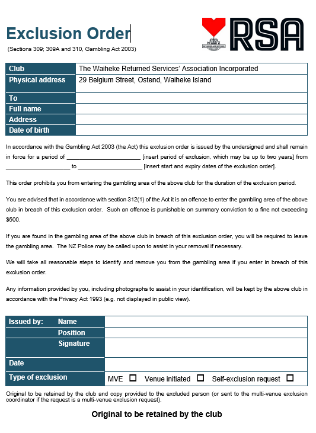 A jackpot player instruction notice (if the club has a jackpot). The cost to have the A1 sign designed, printed and couriered to your club is $150.00 plus GST. To order the compliance sign - click here. It is not a formal requirement for a club that mainly applies its gaming profits to have a grant form for third party grants, but it is best practice to have a form and to follow the rules that apply to larger gaming trusts when making external grants. You can order a grant form as per the sample image. The cost to have the grant form adapted for your club and the print files supplied by email is $60.00 plus GST. To order the grant form - click here. To enable the licence renewal form to be easily completed, it is prudent for your annual accounts to include the same categories that are required for the Gaming Machine Account Summary (GMAS) form. Have an audit expense apportionment between $1,000.00 and $5,000.00. In early 2016, Max Carr (Department of Internal Affairs’ Investigating Accountant) prepared a set of template accounts for clubs. The template accounts set out the indirect gaming costs that need to be apportioned, record the net proceeds applied, and separate the club equity from the gaming equity. Click here to download a copy of the template accounts.